IMVU Badges to promote and support this forum are on the way! I will make an announcement when they are ready to grab. -Sorted all the forms into categories. If you click on the category name you can see all the most resent posts in that category. -Added Find A Mesh category. Will also be adding mesher's shops there too. -Added this announcement forum so you can quickly get up to date with what is happening here. -Any Actual Sales/Transactions in threads or their Mitigation. Any such transactions must be held privately and with an 'at your on risk' understanding. -File Sales or Their Listings. Too much a can-o-worms and they are hosted elsewhere already. Want to suggest more or discuss any of this? Head over to the feedback forum and join in! Social Forums are now a thing! The next round of new requested forums has arrived. In Fun we now have the Graphic Artists Fun Zone! Forum. Social Has two new forums! Been a busy work weekend so haven't done much the last few days. Will be back at making regular updates soon. Slowly rolling out new ranks (the title that appears under your name) as suggested by our users. Look to see them popping up over the next week. Some will be for anyone to wear, others will be awarded for special achievements or recognition. Also asking for suggestions for Info Threads that should be made. Added more Creator specific fields to our profiles. You can add this new information by going to your User Control Panel (upper right drop-down) And then click the Profile tab. Also cleaned up what shows on the member list to keep that area a bit more tidy. Going to attempt making a new thread a day on various commonly asked creator topics. To suggest a topic please use this this thread. Not much to update here but I have been busy. 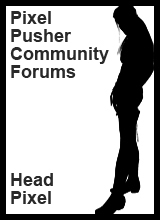 The PixelPusher Website now has prominent links to this forum on it. Slowly working on updating the whole site but a few of the core pages have it now. Have some other things in the works. Regular recurring contests will be starting up next month! So get your creating fingers ready! As time permits I will still be publishing INFO posts on regularly asked Creating issues. At least that's one thing IMVU's Discussions has going for it, its treasure trove of lost users so its easy see what information is lacking and sorely needed! Well first off and probably the most obvious, I've merged the PPC Announce forum with this feedback forum, seemed a bit redundant having the two separated when a lot of the same info was in both areas. Second update (and why there was no amazeballs new Admin knowledge drop Info Thread yesterday or today) we got hit and hit hard by spambots last night. Over 100 new accounts were made, and dozens of spam posts filled with malicious links were posted. the Mods and my night was filled dealing with that, weeeeeeeeee. They are still lurking about trying to get in, you can see them in the guest count bellow. Our new impressive 'most users at a time' number is due to them too. Well at least we now look super popular, lol. Just a general reminder on that topic, if you see that kind of random posting here, or anywhere for that matter, NEVER CLICK ON THE LINKS! There are some nasty people out there in internet land. A program I HIGHLY RECOMMEND is Malwarebytes. https://www.malwarebytes.com/ They have a free limited version but trust me, bite the bullet and get the full paid version, its not a lot of money and its well worth it! We will always be keeping our help and promotional sections for all eyes to see as I do understand the needs of the forum Lurker user, (heck I am one a lot of the time) the ones that will come for the information but do not like to participate. *Waves to the Lurkers* Our primary goals here are to help, share, support. and a lot of the time that is done passively and we will never know all of those we will help out. Ohh, we are one user away from 200! I already know who it is, just waiting for a verification confirmation.